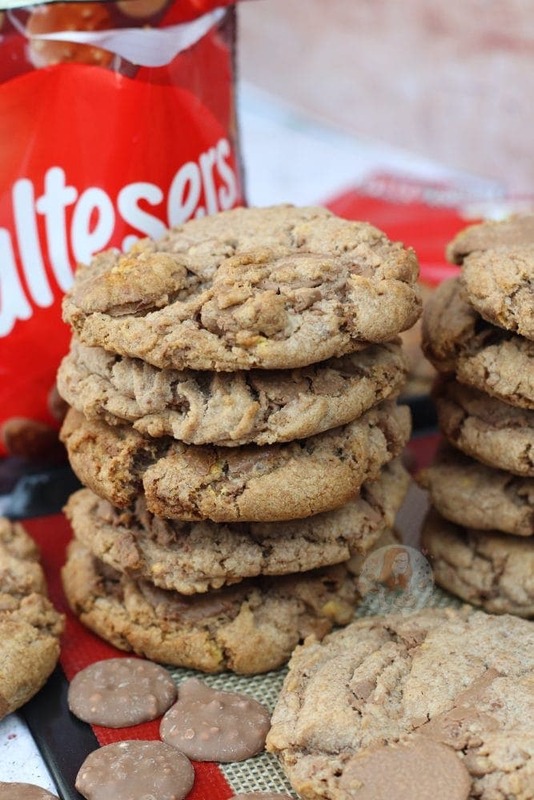 Gooey, Crunchy and Delicious Malteser Cookies with Malteser Buttons and Maltesers! So recently I did an experiment with these after the new Malteser Buttons were released in the UK, and I teased the idea of them on my Twitter account. The response was hilarious because I knew people would want them, but it was better than I thought it would be! 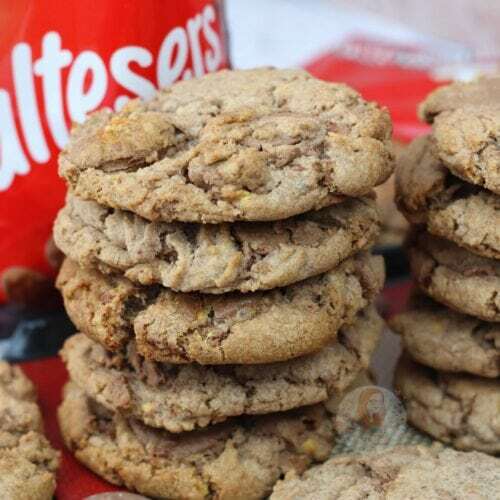 I personally really like Maltesers, but I know so many people that aren’t a fan that I am still surprised to this day how well my Malteser recipes do! By far, my Malteser Millionaires Shortbread has completely surpassed any imaginations of how well it would do after going viral on Facebook, and is already my most popular recipe so far this year, even though it was only posted less than four months ago! After I realised just how successful it was, I knew I needed to post another belter… and these were the first thing I thought of. 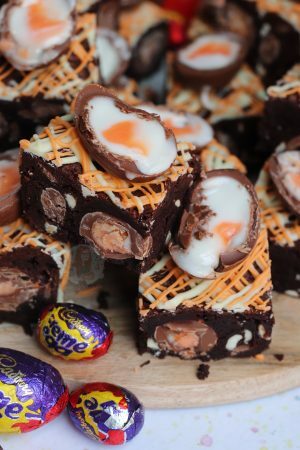 I already have quite a few other recipes on here to do with the grand ol’ Malteser and you all seem to love them. 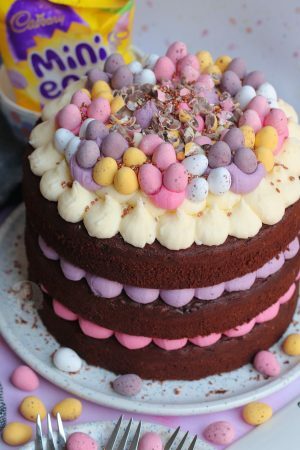 My Malteser Cheesecake is probably one of my oldest and most favourite, and my Malteser Cake being quite a showstopper, but sometimes you just want something easy, that will last a bit longer. I say last a bit longer… these are always devoured in record breaking time so oh well. I couldn’t RESIST using the new Malteser Buttons in these beauties. 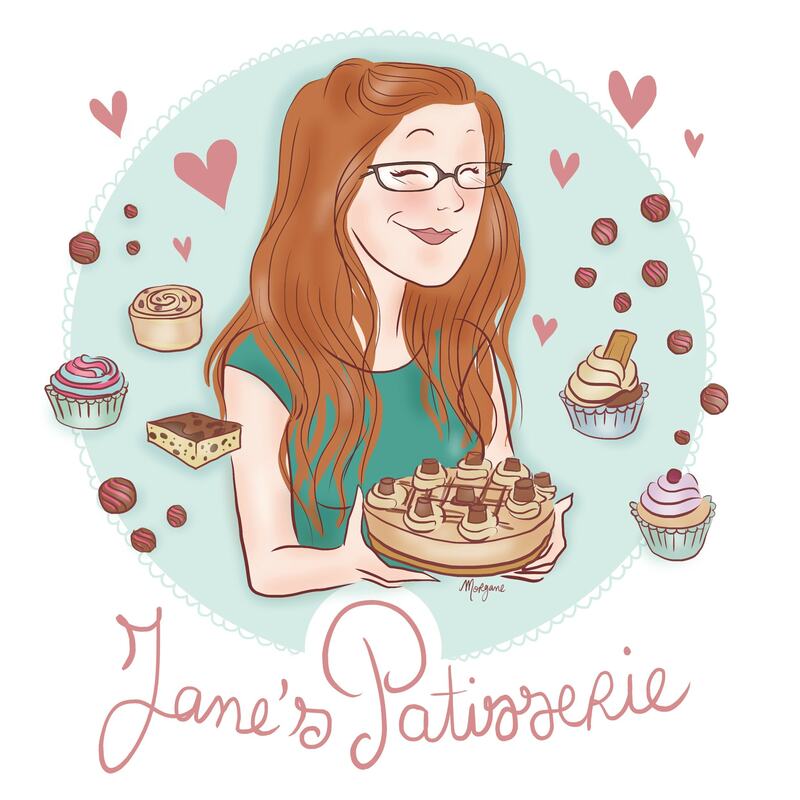 I realise that not everyone in the world has access to these, but as I am a UK based food blogger, I use what I have available. 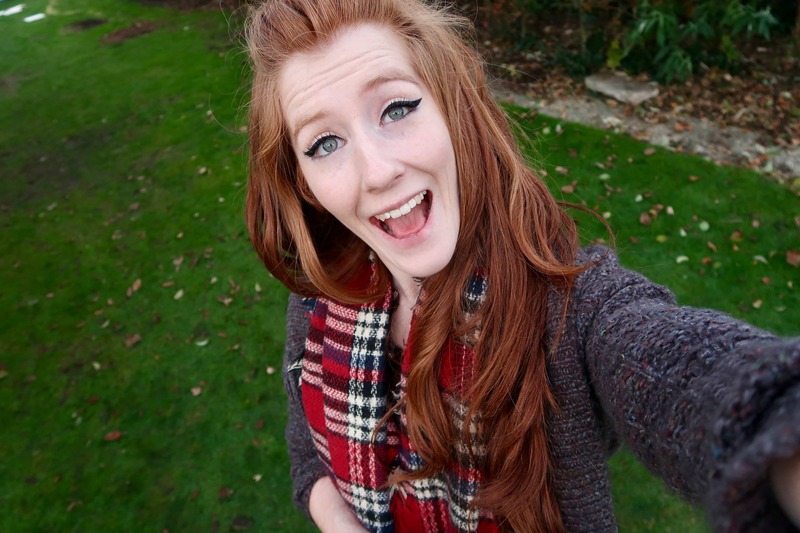 And how could I not use something that I utterly adore?! You can easily however use the Chocolate Malteser Bar that you can buy, and just chop that up instead. 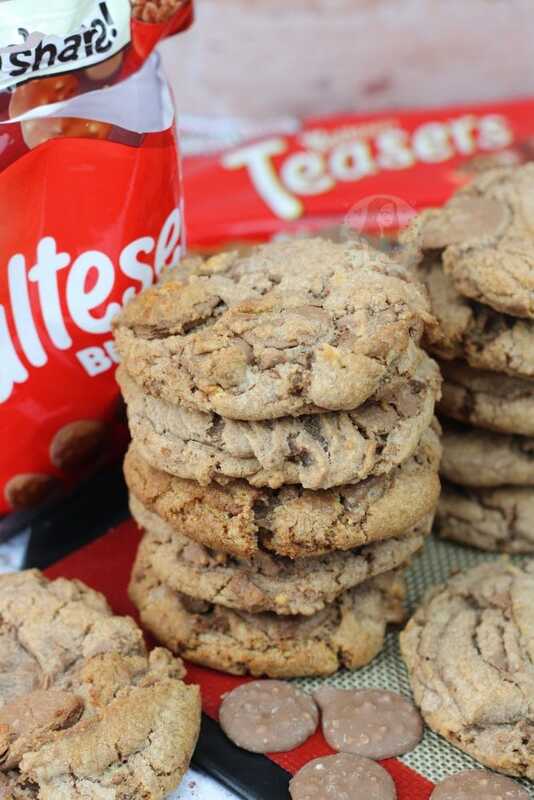 Because I wanted to make these taste as Malteser like as possible, I use what I called Malt Powder. Malt Powder is basically the malt drinks you can buy in the Hot Chocolate section of the supermarket, such as Horlicks, or Ovaltine. I have tried these with the malteser Hot Chocolate you can buy, and it just didn’t work as it is completely different in formulation. The good thing about Horlicks or Ovaltine, is that they bind the cookie, like how the flour and cornflour does. Because of this, the cookie mixture really is a thick thick dough, so it can take a bit of welly to get the chocolates inside the dough, but its worth it. If the mixture is incredibly thick, theres a much higher change of the cookies baking successfully, and not spreading into thin pancakes. The Malt Powder is completely optional however, so you can easily use Cocoa Powder instead, but obviously it will be less Malteser like! As you can see from the images, they are PACKED FULLLLLL of chocolate goodness, and I just can’t resist an overload of cookie. When I posted my Rolo Cookie recipe recently, someone sent a message saying “Are you sure this is the right amount of chocolate? It seems a lot…” and they realised it was, and they’re just epic cookies. I like to take the piss a bit when I add chocolate into something for example, as I love them to be indulgent. You can always add less to make it cheaper, but I tend to buy all my chocolates when they’re on offer to help myself out! Preheat the Oven to 180C/160C Fan, and line 2-3 large baking trays with Parchment Paper. 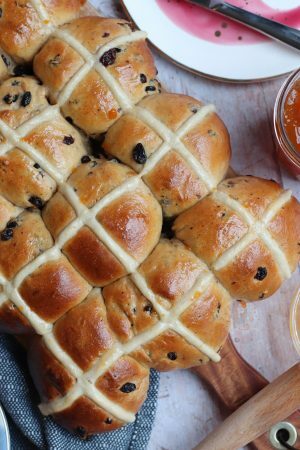 In a bowl, whisk together the Plain Flour, Malt Powder, Bicarbonate of Soda, Salt, and Cornflour. This just distributes all the ingredients evenly. Add in the Egg and whisk again briefly to combine. Add in the Dry Ingredients, and beat till a cookie dough is formed. 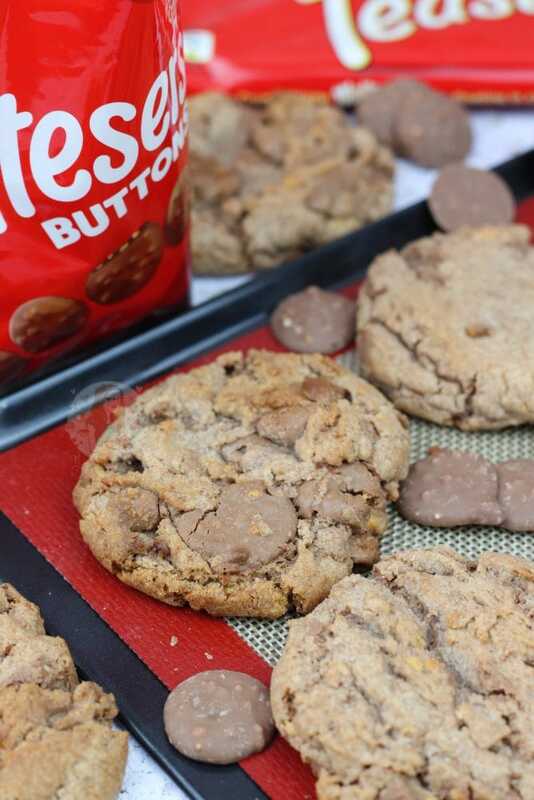 Add in the Malteser Buttons (or chopped Teaser bar) and Maltesers, and combine - I just do this with my hand and a spatula. Using a 5-6cm Ice Cream/Cupcake/Cookie Scoop, scoop your mixture. The mixture can be larger than the scoop, but it gives you a general idea of how to make them consistently sized. I made 15 Cookies out of mine, as I made them quite large. 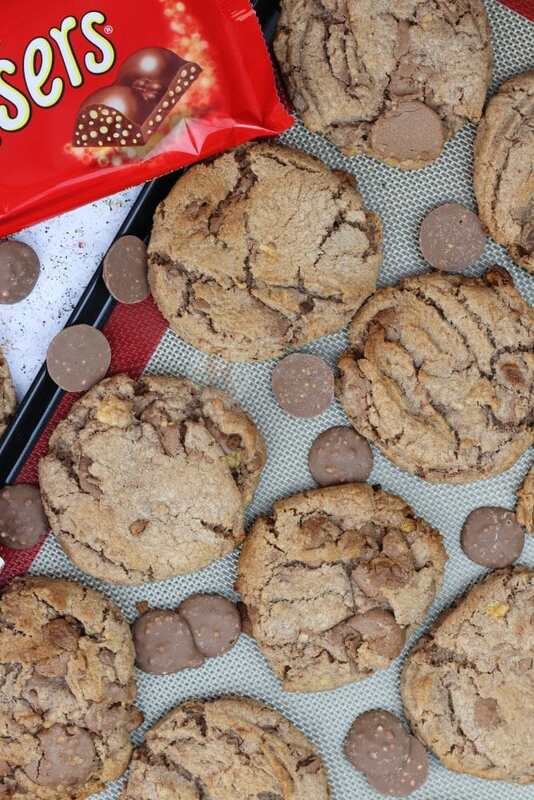 Press any leftover bits of chocolate from the bowl into the top of the cookies. You want to make sure there is only about 6 cookies for a 40cm long tray for example, so that when they spread in baking, they don't touch. Bake the Cookies in the oven for 11-13 minutes, and then leave to cool on the tray for 15 minutes before transferring to a wire rack. Enjoy! I used This Cookie Scoop for my Cookies. It's a 5cm one, so I just loaded a bit more into each cookie to make them larger. These cookies will last up to five days, if not eaten already. 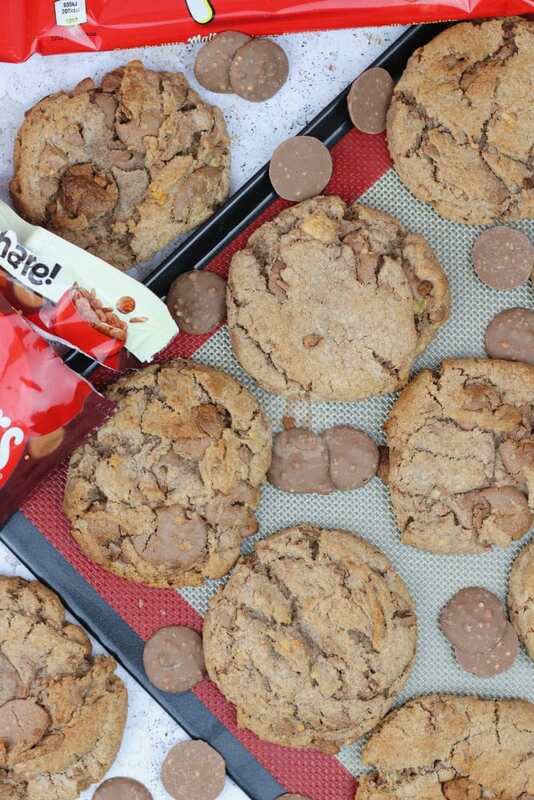 If you can't access the Malteser Buttons, you can use the Malteser chocolate Bar, chopped up. 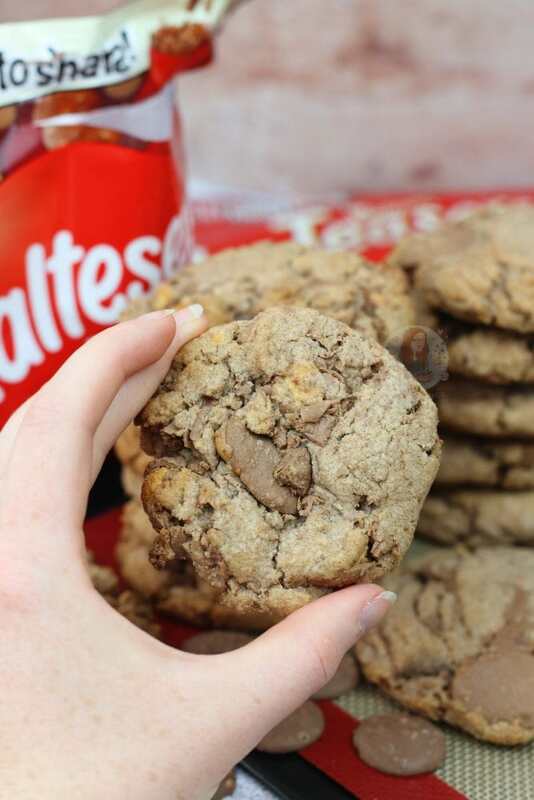 If you can't access that, you can use more Maltesers, but I'd use normal chocolate chips instead. . 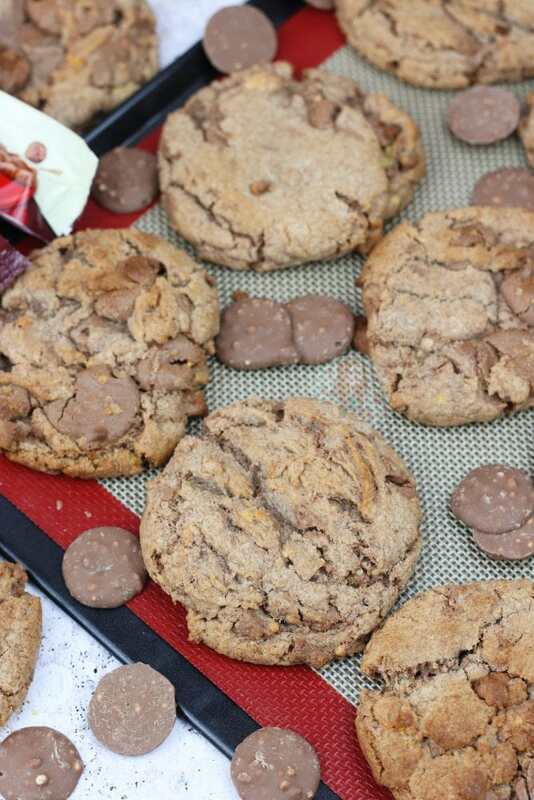 The cookies are naturally thick and not meant to spread - if you want them a bit flatter, pat the mixture down a bit. 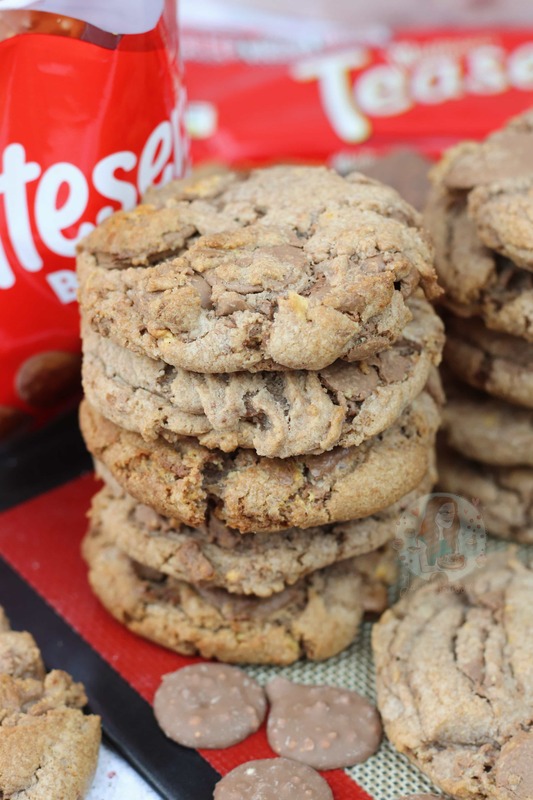 Find my other Cookie & Malteser Recipes on my Recipes Page! Newer Previous post: Raspberry Ripple Ice Cream! I’ve just made the Malteser cookies , they didn’t spread for me I thought my mixture was too dry as it didn’t bind together at the end. I am going to try again , Should I add more melted butter ? I’ve been making cookies from your recipes for ages, then always turn out amazing !! I’ve just tried to make the Malteser ones and when baked they have hardly spread at all. I noticed that the dough was different to other cookie dough’s but I put this down to use of melted butter… is there any reason why they haven’t spread ? Hiya – Many of my recent cookie recipes use melted butter – its just a thick cookie dough to prevent flat cookies. They’re meant to be thick. Next time just squish them a bit and they’ll be dandy.